Somo, a power-mad practitioner of the Komo religion, is enraged by his wife and son’s theft of certain magical fetishes and vows to hunt down his progeny, Nianankoro, and mete out revenge, whether he be under a lakebed, on the earth or in the sky. 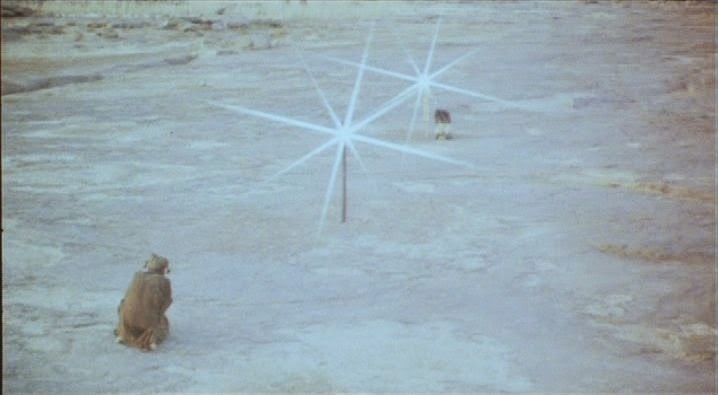 Secretly he fears his son’s potential to one day eclipse him, and so he performs sacrifices to compel various earth and fire gods to his favor and hypnotizes two slaves to bear a magical pole that is drawn inexorably towards his quarry (one the film’s most strange and enduring images). 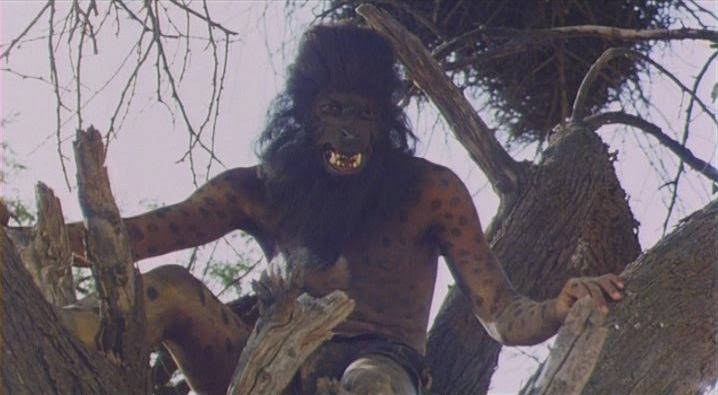 Nianankoro, meanwhile, is sent on a quest by his mother to seek aid from his Uncle Djigui, Somo’s twin. 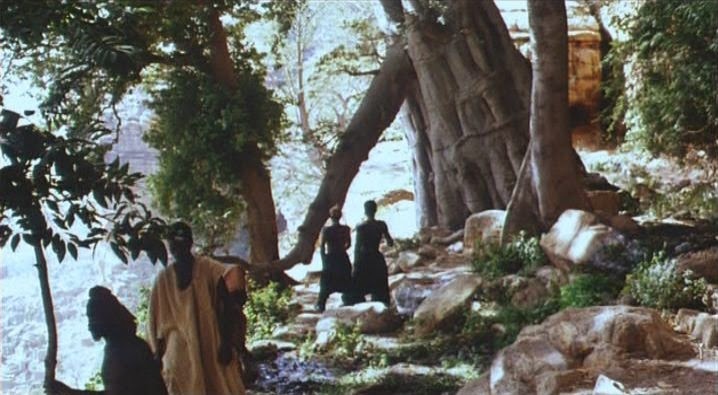 The epic journey takes the young man across several neighboring kingdoms, including the Fulani (or “Peul” in the Kino Video DVD translation), who arrest him as a trespasser and thief. However Nianankoro’s magic is too strong for them, and in front of their king, Rouma Boll, he freezes his attackers with a curse. Whether Rouma is truly benevolent or just utilitarian is never clear, but he allies with Nianankoro, and the latter saves the Fulani from an approaching army of painted warriors by harnessing fire and bees. However their relationship sours after Rouma asks his guest magician to cure his youngest wife, Attou, of infertility, and, left alone, the two youths fall in love and sleep together. Nianankoro’s confession is marvelous in its bravery and awkwardness and Rouma’s reaction, again ambiguous (I read him as both furious and wishing them the best), is to semi-officially unite the couple and banish them. 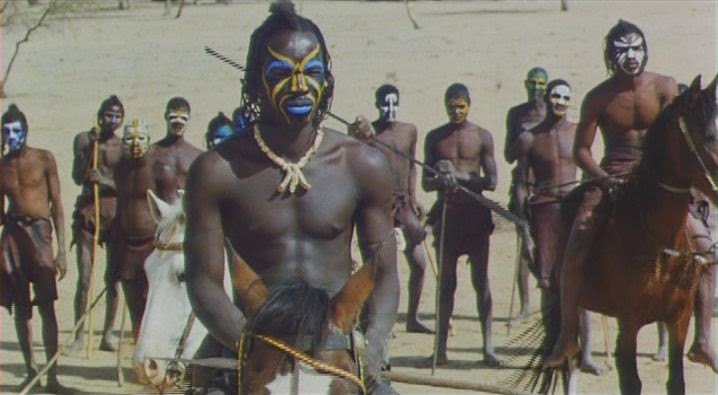 Hot on their heels Soma arrives among the Fulani, disguised as Djigui (this is one of the more confusing bits), and incapacitates Rouma’s men although he is able to extract little and soon moves on. Soma meets with the Koro elders of these distant lands and bests his rather timid opposition (mainly the younger faction) during a complicated exchange of proverbs (e.g. “My son is the knife blade, but I am the handle. Not even the sharpest knife can cut its own handle.”). Nianankoro, with Attou in tow, finally arrives at Djigui’s kingdom along the cliffs of a forested ravine, and the two are ritually cleansed at a magical spring. Djigui explains Soma’s corrupt monopoly of Komo magic and arms our hero with the wing of Kore, a wooden paddle with a zigzag cutout and fitted with a gemstone “eye” that was given to Nianankoro by his mother. 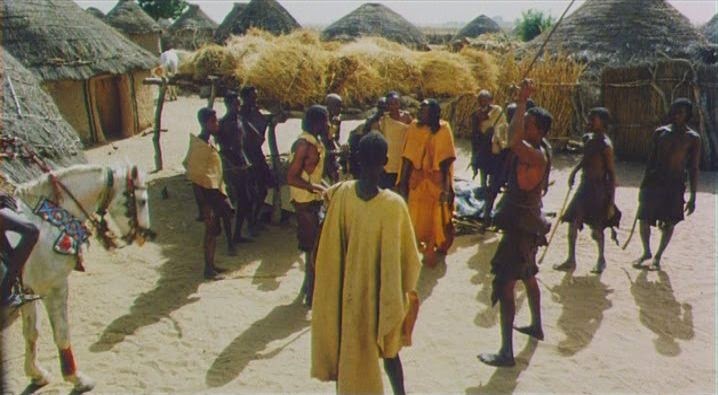 Attou wishes to accompany her husband into battle, but learns that she is pregnant (Djigui predicts that her child will carry on the Bambara tradition, but darkly alludes to the difficulties his descendants will face, including the coming of Europeans and decades of slavery) and is ordered to stay behind and protect the child. Nianankoro and his father confront each other in a supernatural showdown, invoking their gods against each other until both are consumed by a blinding light that lays waste to all and sundry. 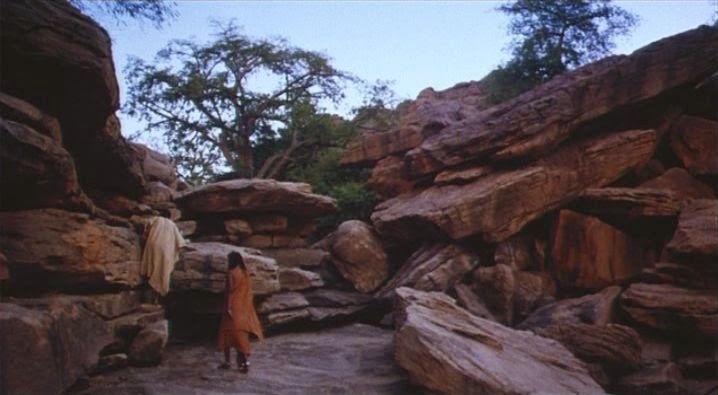 Years later Attou and her son visit the site, now a desert, and the child uncovers two smooth white ostrich-egg-sized stones from the sand (presumably Soma and Nianankoro’s remains, now reduced to fetishes) and retrieves one for his waiting mother. 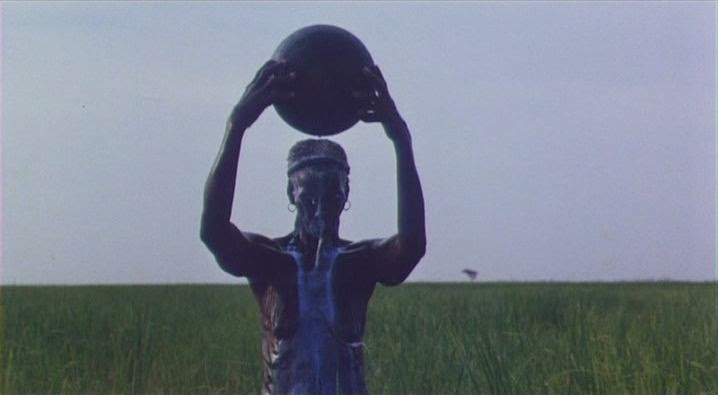 Souleymane Cisse’s established himself as major director with his previous film, The Wind / Finye , where he depicted the clash of traditional and modern Africa, but it was Yeelen, in which he seamlessly welded a boldly modern aesthetic (visually, aurally, structurally) to an unambiguously traditional subject, that Cisse created what may be the defining West African film. Yet Yeelen’s reputation as both a sanctified classic and an inaccessible experiment has tended to blind viewers to its very real pleasures: its intricate sorcery of curses, incantations, spells and counterspells, its range of color and geography, its fantastic tribal-jazz fusion soundtrack, its confident intensity, sensuality and showmanship and its timeless epic grandness. 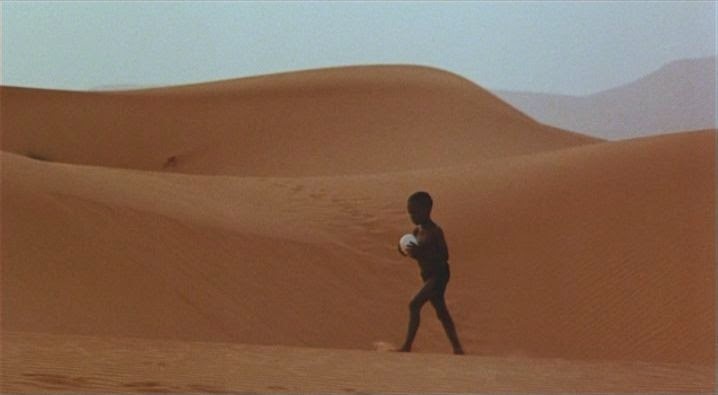 I remember that when I first saw Yeelen (on VHS, as an over-earnest college freshman), I found it slow and inscrutable, and yet revisiting it recently without my previous expectations was a revelation. It gripped me effortlessly and drew me under its spell. Yeelen is further proof that solidifying a cultural-cinematic identity is more about legend than history; more about interpretive fiction than inflexible fact. In this sense, it is oddly similar in function to How the West Was Won, Excalibur, The Ten Commandments, Hero (2002), et al., in which serious faces and ‘historical’ subject matter have not necessitated a solemn or academic reception on our part. Quite the opposite: it is these films’ role as populist entertainment that explains their contribution to cultural mythology and national identity. It is a great film. For me it seems to look from out the time and out a fix place on our planet earth and I discover what human is (or may be) The future starts with the message of the young -innocent-boy. 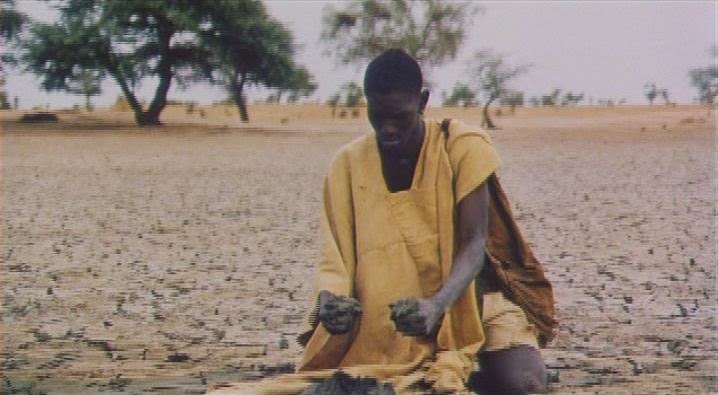 Thanks for this film to enter in areas - by great pictures, thoughts and feelings- of mankind.